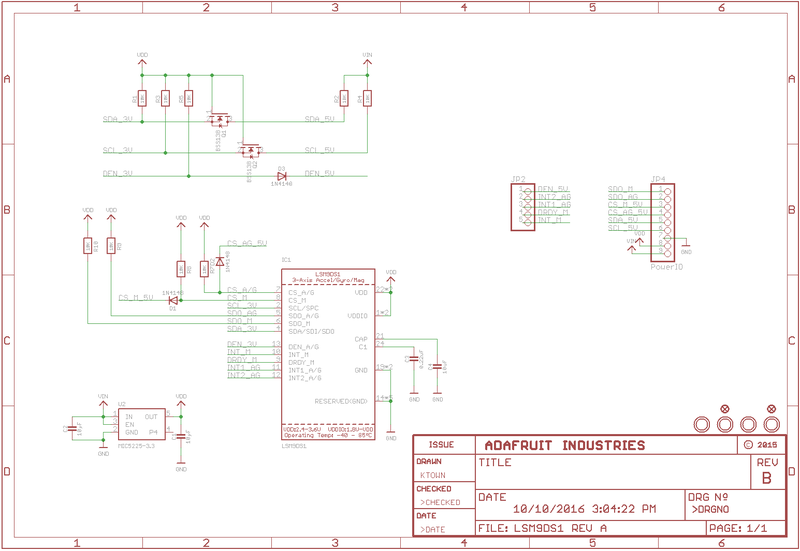 I'm adapting a breakout board for the LMS9DS1 IMU to suit my own needs. This breakout board has an input range of 3-5V and works on 3.3V. However, the circuit, as shown below, seems to have two ways of dropping the voltage. The MIC5225 (bottom left) is a voltage regulator, but don't MOSFETs (BS138, top left) also serve this purpose? What is the purpose of the extra MOSFETs? And can I drop both the regulator and the MOSFETs if I already have 3.3V? U2 is a voltage regulator providing a +3.3V supply. Q1 and Q2 are being used as logic level shifters to translate +5V signals to +3.3V levels. They do not behave the same. If you have another +3.3V supply you can eliminate U2, assuming your +3.3V source provides the same or higher current, same or better switching noise (if any), etc. What will happen if I feed this rangefinder 3.3v? Why are the output voltages way too high on this stacked LM317 circuit? What is the point of this MOSFET? Which kind of regulator/battery setup should I use for 5 volt microcontroller and transmitter circuitry for optimum performance?